Here we are, in the face of another New Year. What do you have planned? More exercise, less junk food, more time with your family? 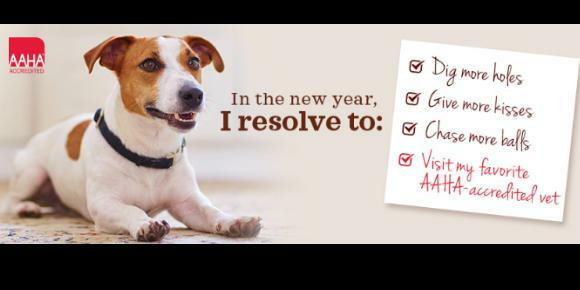 Every year, thousands of us resolve to improve our lives in one way or another. But what about your pets? Here are a few resolutions that can help improve their (and in some cases, your) wellbeing and long term health! 1. Measure your pets’ food each and every time. Most owners estimate or eyeball the amount they feed their pet each day. This can easily lead to obesity. Talk to your vet about the correct amount to feed your pet to keep them at a healthy weight. 2. Try a new activity with your dog. Do daily walks get mundane? Try hiking, agility classes, or even flyball or dock diving. Participating in these activities gets you out and more active as well- win/win! 3. Keeping those wellness visits up to date. Have we seen your cat lately? Did you know that cats are the most numerous pet in America, yet their wellness care is often overlooked? Cats are masters at hiding disease. Unfortunately, many sick cats either require significant medical intervention or are beyond our help by the time we see them. Early detection is the key! 4. Update your pets’ ID information. Are your pets’ identification tags up to date? Are their microchips updated with your current information? Life happens including moves and phone number changes. Be sure all of your pets have current identification. The list can go on and on, but this is a good start! As we welcome the New Year, we at Dogwood Veterinary Hospital and Laser Center look forward to working with you and your pets to ensure a happy and healthy coming year!